Lucky us, we got to go behind the scenes at one of Reykjavík’s favorite restaurants: Sumac. We’re still drooling about the Moroccan and Lebanese-inspired dishes they cooked up for us. Explore through the photos below and make sure you're not reading this on an empty stomach (you've been warned!). You might be wondering what the name Sumac means given that it doesn't sound Icelandic and isn't 10 syllables long, and you'd be right! Sumac is actually a Middle Eastern spice grown in clusters of small red berries with a tangy lemon flavor profile. The name is an ode to the North African and Middle Eastern influences behind the restaurant. Sumac's interior was designed by Hálfdan Pedersen, who also designed the trendy Kex Hostel in downtown Reykjavik. We learned that the space was inspired by Beirut, Lebanon, which was formerly known as the Paris of the the East. Raw concrete walls, mood lighting, and quirky decor like books, magazines, and potted plants. Can we just move in? 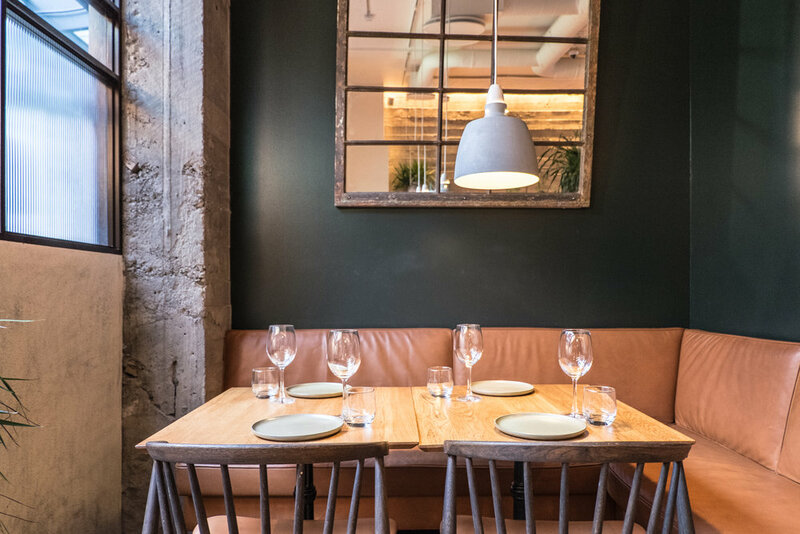 We loved Sumac's cozy little nooks with earthy-toned leather seating, perfectly sized for an intimate group dinner conversation. Neutral stone dishware and wooden chairs felt like the perfect Scandinavian touch to the space. Owner & Chef Þráinn Freyr Vigfússon and Head Chef Hafsteinn Ólafsson crafted the menu for Sumac with years of planning. 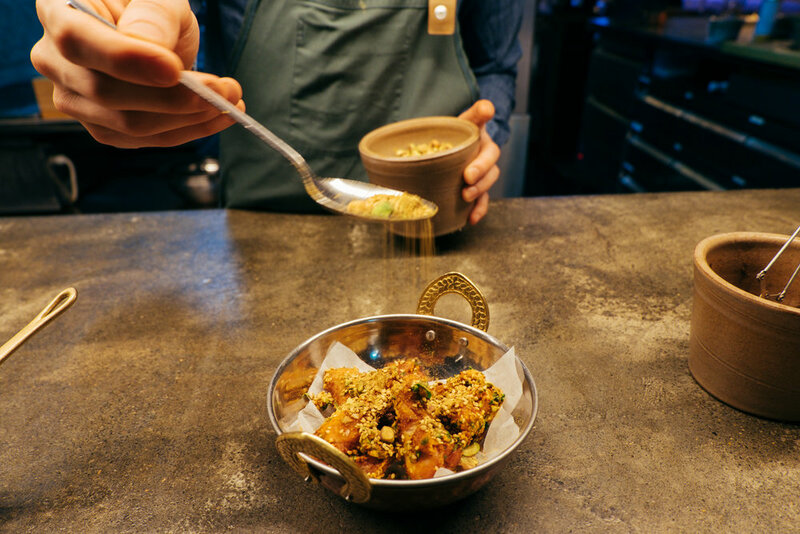 Chef Vigfússon says he had the idea for the restaurant since 2011, "I've been an enthusiast of Middle Eastern cooking for a while and I just wanted to bring something new to the Reykjavik culinary scene, something different, but using Icelandic ingredients." And if that isn't enough, Chef Ólafsson was recently named Iceland's Chef of the Year so clearly your appetite is in good hands. Lebanese & Moroccan flavors are a bit of a rarity in Iceland where it’s hard to find anything but Icelandic cuisine. Pictured above are Sumac’s harissa chicken wings topped with pistachios & sesame seeds and they were 👌🏻. We also added a new life goal to our ever-growing list: learn how to make this beautiful roasted cauliflower dish. It’s covered in Icelandic yogurt, roasted almond slivers, pomegranate seeds, and fresh herbs 🌿. If you're just one or two people, we'd opt to sit at the bar to have drinks and dinner. The open kitchen means you'll get to watch some pretty amazing chefs run around concocting yummy dishes and the staff at Sumac are super friendly and lovely to chat with. There's even a handsome bartender named Thor who will make you a mean Manhattan if you ask nicely. Oh, and we saved the best for last. A warm date cake topped with a toasted hazelnut sauce paired with vanilla ice cream covered in a licorice crumble made with liquid nitrogen. Mmmmm. Sumac Bar & Grill. Laugavegur 28,101 Reykjavík. Book a reservation here.